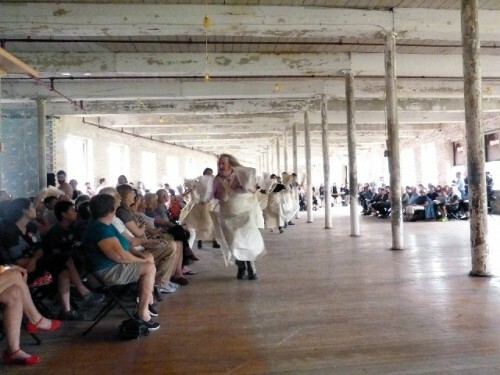 Installation artist Ann Hamilton returned to Mass MoCA. Giuliano photos. She enjoyed again working with the museum’s unique space and light. Hamilton and David Cossin of Bang on the Can. With Mark Stewart they collaborated on Page Sounding. Hamilton adjusting the costume of one of the performers. Moving on all four sides. Lowering to the floor as a group. Working one side of the rectangle. Forming a line down the center. 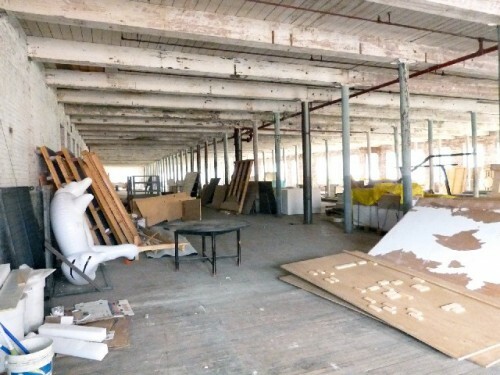 Increasing MoCA’s exhibition space by a third. The Bill has to be approved this week. The outgoing Governor Patrick will have ten days to sign it. "Hearing is how we touch at a distance. At distances greater than the reach of our voice, a waving hand can gesture either recognition or farewell. A light, a cloth or a piece of paper extending the gesture of the hand then becomes a voice. "When its empty of words or images, we describe a piece of paper as a blank page. This blank is full of space. It is also filled with time. There is the time of the paper’s making; the growing and harvesting of the plant, the beating of the plant’s fibers into pulp, then the pulling and drying of an individual sheet. 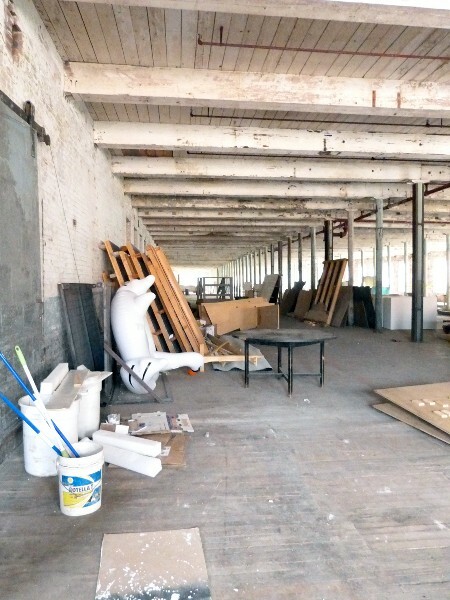 It was my first visit to the vast Building Six of Mass MoCA. Approaching the museum director, Joe Thompson, I asked for an update on the status of a bill that would include $25 million toward developing the vast space as the final phase of completing the campus. 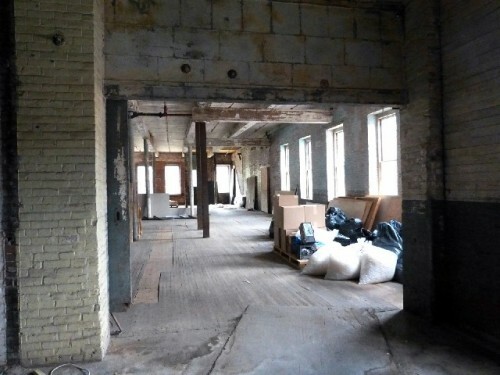 The plan is to match state money by raising another $30 million for the build out. If completed it would increase overall exhibition space by a third. 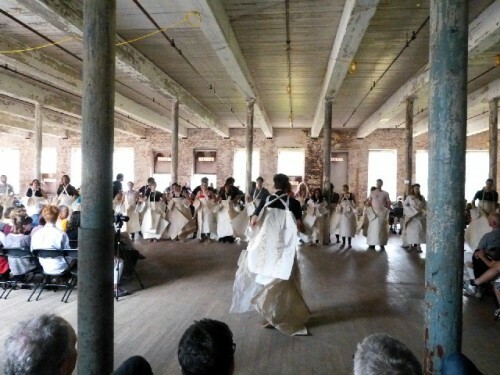 This is precisely what happened when in his final days Governor Michael Dukakis signed the original bill for Mass MoCA. It took years before the actual construction began. 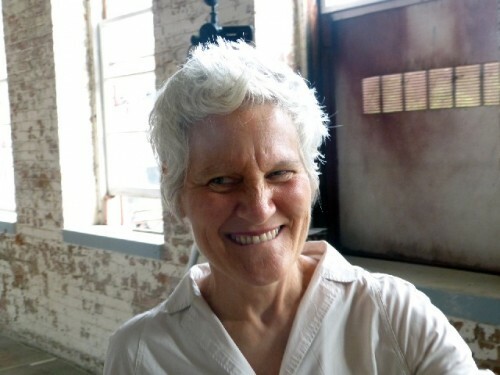 Approaching the artist, Ann Hamilton, I asked if she recalled having breakfast with me in the 1980s during a visit to Columbus, Ohio. We looked intently at each other but memory was dimmed with time. 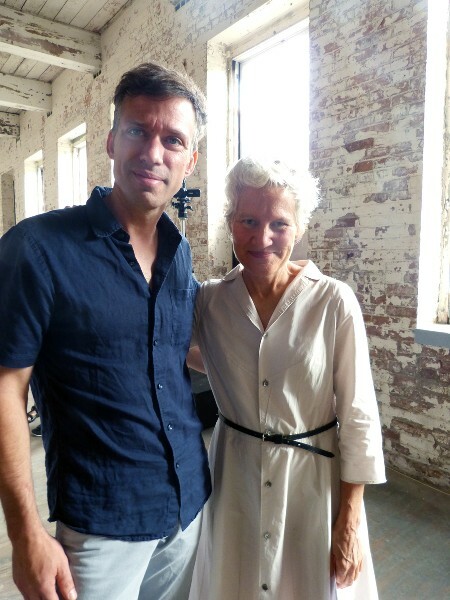 It was a rather spontaneous return of the artist to Mass MoCA. 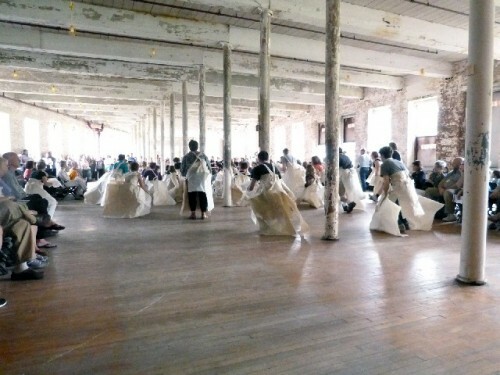 From December 13, 2003 – October 17, 2004 in the vast Building 5 she presented the installation Corpus. It entailed 40 ceiling mounted paper-drop mechanisms consisting of a computer-controlled, pneumatically moved vacuum paper lift actuator, compressor, paper; recorded sound; amplifiers; 24 bell-shaped speakers; spinning speaker mechanism; silk covered windows; and light. The intent was the fill the space about knee high with constantly fluttering sheets of paper. Visitors would activate sound by swishing through the space. The North Adams Fire Department, however, limited the accumulation of paper to ankle height. While effective the installation did not realize the artist’s full intent. 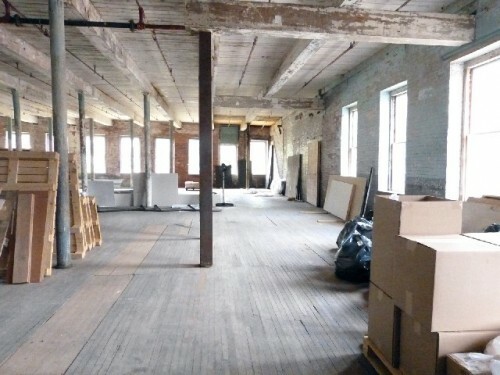 We also discussed an installation prior to that at the List Visual Arts Center. For that 1992 work she stacked a long wall with over 20,000 books supporting and encasing a collection of androgynous bulbous “bodies.” Towering above this dense, textured library represented the authority of knowledge conveyed through the written word, the most highly valued tool in our society. This solid wall of books and bodies formed the background for two actions taking place within the cavernous gallery space. A small, videotaped image embedded in the far wall focused on stones slowly rolling around in the artist’s open mouth. The mouth, the border or edge between the internal and external body, is the site of ingestion, sensual pleasure, and the release of language. The mouth also recalls the ancient oral tradition whereby stories embodying the values of the community were passed on from person to person, as opposed to the written tradition in which the knower is always separated from the known. Aleph, the first character of the Hebrew alphabet, evokes the formation of all words – both oral and written. I suggested that the video of stones in the mouth for me had evoked the metaphor of the Greek Diogenes. To overcome a speech impediment he practice oratory with a mouth full of stones. 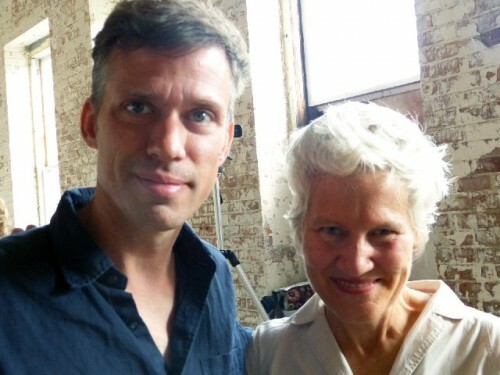 She introduced me to David Cossin of Bang on the Can as a collaborator on the piece. That became clear during the performance. The large space filled with an audience on four sides facing the center with its row of columns. For a Tuesday afternoon the event was well attended and we recognized many from the local arts community. Hamilton was busy dressing some 30 performers with her unique paper costumes. 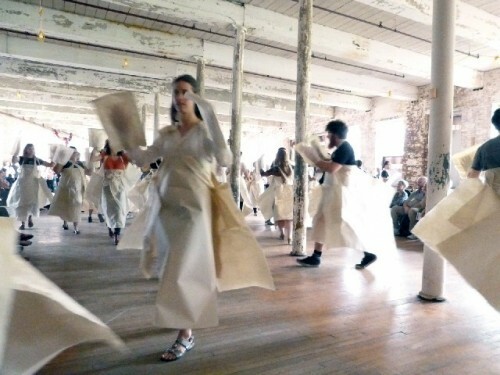 They were large sheets of paper draped over and around individuals. 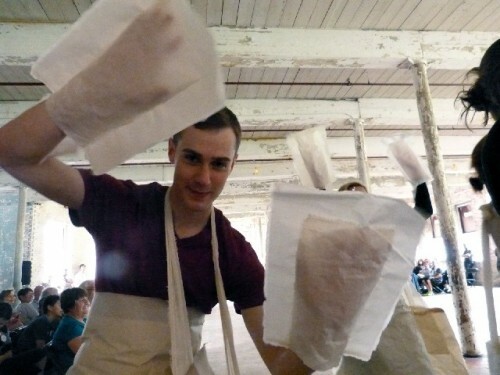 There was also an array of accessories including sheets with hands inserted on several scales. 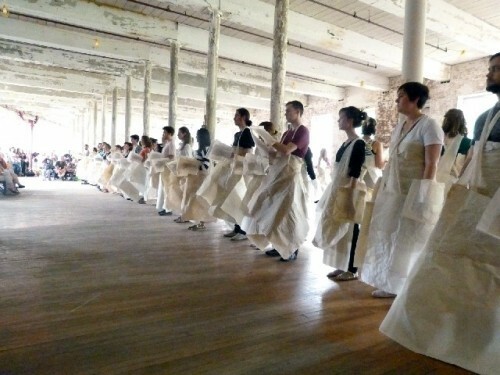 The performers, led by Mark Stewart, entered the space with a range of movements that activated the space with soft breezes and crinkling, percussive sounds. During he next 45 minutes there was an amazing variety of sound and visual textures. These ranged from simulating falling leaves to the sounds of wind and rain or the clapping of thunder. 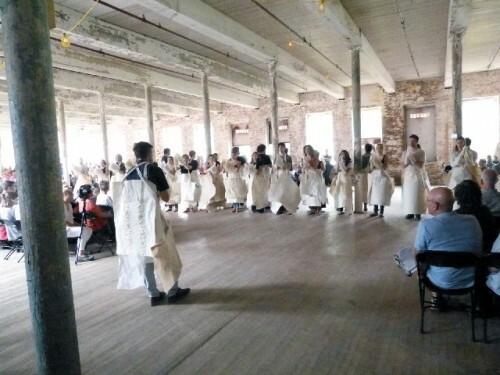 There were percussive passages as the performers rhythmically slapped their bodies. They moved about the space making direct contact with all sides of the audence. At intervals Hamilton with a mike recited the poetry of Georges Perec. It conveyed aspects of paper and how it is used for everything from diaries to shopping lists and notes on the back of an envelope. There was a sense of the aboutness of the an empty page and how it exists as a space, plane, and intentionality for literary and communication activism. Since the invention of papyrus by the Egyptians or the vellum of Irish monks used for the Book of Kells varieties of supports have recorded and expressed the human condition. A copy of Magna Carta now on view in Boston at the MFA soon will be coming to the Clark. After the performance we spoke with Hamilton. Charles Giuliano Congratulations on a successful piece. I understand that it came about rather quickly. 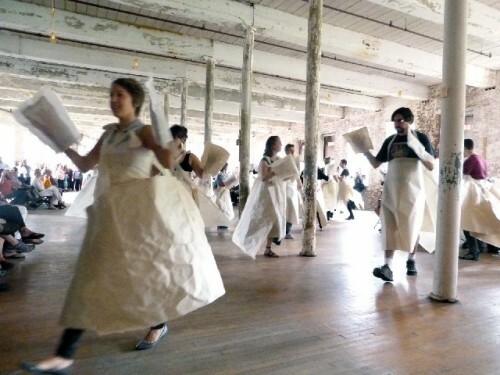 Ann Hamilton I’ve been working with Dieu Donné a studio in Manhattan that works with artists and hand made paper. It started a couple of years ago. As we were developing the paper I found the sound it so interesting. CG Are you making paper? AH I’m making it by hand. This is all hand made abaca. CG That’s a lot of paper. AH It is and it’s a lot of hand made paper. There’s a project manager and a lot of interns at Dieu Donné. CG Are these the interns? AH These are all Bang on the Can fellows and faculty. We started here last Thursday. We’ve had just four sessions. I’m working with Mark Stewart and David Cossin as the directors. CG It’s a pretty exciting piece. It has potential. AH It has potential. The space and light are incredible. The musicians are incredible. It was a chance to work together. CG Paper is your medium. What does it mean to you? AH Paper is empty of words and full of space. So the work is thinking about the possibilities of that emptiness. The sound of the fiber is what connects us here. CG This has been an ongoing concern for you. How far back does it go? AH I did the project here in early 2000. with paper dropping from the ceiling. My work has come out of thinking of the page and language. CG That was the MIT piece with the books and video of Diogenes with stones in his mouth. AH Yes. This kind of coming to language and ways of knowing that parallel language. CG Did you write the poetry for this piece? AH No that’s from Georges Perec. CG Thank you for your time. 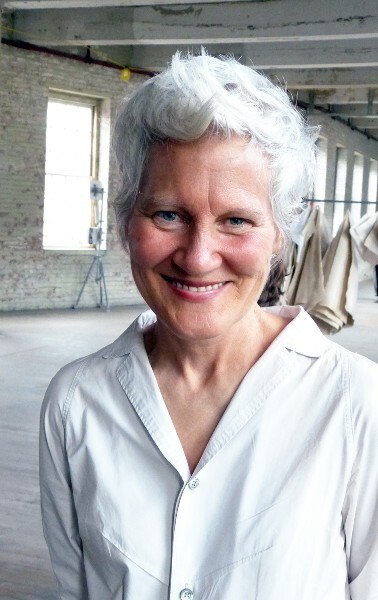 "Reading your piece on Ann Hamilton, I discovered the French poet Georges Perec. I looked him up and found his poems very interesting. I also saw her at the List in 1992. Thanks, it was good to read your article." "About 5 yrs ago I stayed up almost all night at the Winter Garden to be at the Bang On A Can 24 hr marathon." 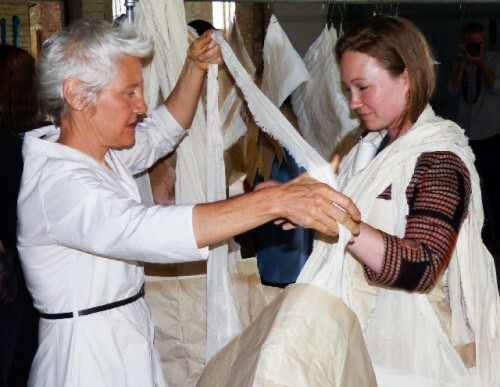 "Love Ann Hamilton any thing she does i s glorious."